Goodness, I really just cannot even... my baby girl is going to be turning FIVE this weekend. Where has the time gone? I feel like it was just yesterday that I was carrying her in my belly, and giving birth to her, holding her for the first time and snuggling her squishy little cheeks up close to me, breathing in her fresh newborn scent. Okay, now I'm crying. She's grown into the sweetest, smartest, funniest, most beautiful (inside and outside) and most helpful little lady, always helping me out around the house, picking toys up, getting me water if I need a drink, and of course these days she's busy being the best big sister and loving on her baby brother. A role she is flourishing in. So with the upcoming arrival of her 5th birthday, birthday presents of course are a must. 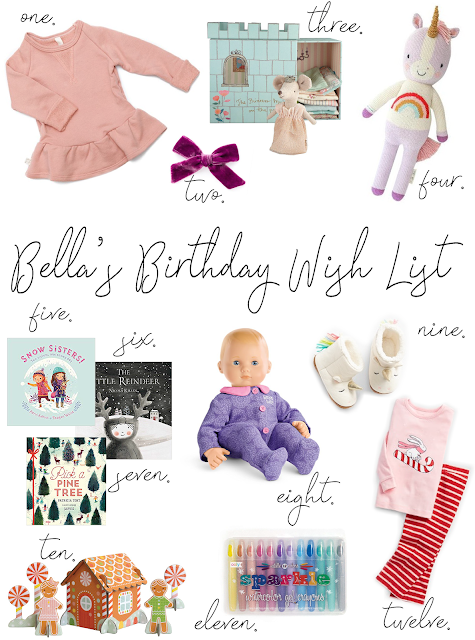 She's been asking for some specific items this year and I can't wait to give her a few of them for her birthday (the rest might have to wait until Christmas lol)! She loves books, and dolls (she's been begging for a bitty baby), anything art related, little toys (especially Maileg mice that fit perfectly into her dollhouse), and of course clothes and Wunderkin Co. hairbows (she's quite the little fashionista). I try to be conscious of what we bring into our home since we love to keep things somewhat minimal to avoid clutter and stress, and I know all of these items are things that will be loved and played with (or worn) again and again. She's been asking for a Dairy Queen ice cream cake for her birthday (which also makes life easier for me since I'm pretty busy taking care of a newborn and recovering from childbirth) and I'm sure some balloons and a few streamers and decorations will make their way into our home on her birthday to make things extra festive. After all, it's not every day you get to celebrate your most favorite little girl turning 5! I can't wait to see her face of her birthday when she opens her gifts!